Micro-Needling works in two main ways. Firstly, it creates micro-channels in the skin for the up-take of carefully selected, cosmeceutical grade vitamin serums. Thanks to these pathways, vitamins and nutrients are delivered deeper into the skin to feed it from the inside out. It allows 80%+ absorption of vitamins from serums, compared with just 7% if applied on skin that has not been treated. Secondly, Micro-Needling disrupts the collagen fibres and therefore stimulates the collagen production and repair process. The result is more collagen fibres that are stronger and closer together. This helps the skin to look younger and improves over all skin tone. For this treatment, a topical anaesthetic cream will be applied to the skin for 15-20 minutes and will then be thoroughly cleansed off. A small roller with micro-needles is rolled onto the skin 2-3 times around the full face and neck. Serum is then applied to the skin and massaged in for a couple of minutes. 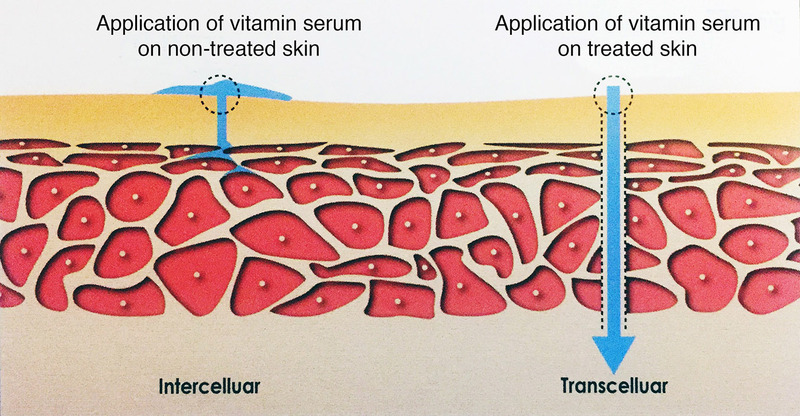 Due to the micro-perforations in the skin, the vitamins are able to travel down deeper into the skin to be absorbed where your body will make use of them in the coming days and weeks. Your cells will be healthier, more hydrated and your skill will appear plumper and more youthful. -Phyto-Hyaluronic Acid, which not only moisturises the skin but has regenerative properties. -Anti-wrinkle peptide (MATRIXYL 3000), which increases the synthesis of the major components of the extracellular matrix, which include collagen and elastin. Micro-Needling is a great treatment for hyper-pigmentation. However, SPF 50 is a MUST as sun damage will make the hyperpigmentation worse. Serum with Kojic Acid will help to break the bonds in the melanin that creates the visible hyperpigmentation. -Nordihydroguaiaretic acid (NDGA) and oleanolic acid help reduce acne and pimples. NDGA is a cell growth regulator that inhibits hyperkeratosis (excessive build-up of skin cells on the surface of the skin) and inflammation which traps the oil in the skin, causing blackheads. -Oleanolic acid fights hyper seborrhea (excess oil production). These two ingredients stop excess production of sebum by 54.1%, and reduce inflammation in the skin by up to 72%. Topical numbing cream is applied to the skin for 15-20 minutes to ensure that your treatment is completely pain free. There may be some discomfort on the forehead area, but this would be mild discomfort. What do I need to do before and after? Please come with minimal makeup if possible. Eye make up is ok. Your face will be cleansed pre-treatment. After treatment – please don’t apply make up for 24 hours. The following day, be careful to only apply makeup if the skin has healed well. Foundation ideally should be applied 48 hours post-treatment. Please keep your skin hydrated and drink lots of water. After treatment, we apply SPF 40-50 to your skin and we ask that you apply a cosmeceutical grade SPF 40-50 that does not clog the skin for 2-4 weeks post-treatment, but ideally on-going on a daily basis. We recommend that you look at your foundation and skin care and use non-pore clogging makeup and creams. How does Micro-Needling increase collagen production? The body’s natural instinct is to heal. By creating micro-traumas to the skin, the body will flood the area with collagen and try to quickly repair the area. It is part of the natural healing process. 4-6 recommended for maximum benefits. 45 – 75 mins depending on package.